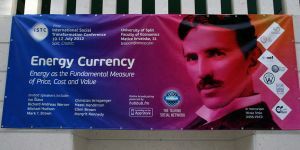 - International Social Transformation Conference: Energy currrency, Energy as the fundamental measure of Price, cost and value. New types of money based on energy could provide the best way to protect your wealth and/or business in the next financial crisis. This was a conclusion of trail blazing conference held in Split, Croatia on 10-12 July. Bankers and scholars have neglected to consider different types of money as way of resolving the many intractable perils and risks facing the world.